Stories and photos of farmers are interspersed with tasty seasonal recipes. “Farm Fresh Journey: Santa Fe Farmers Market Cookbook” by Douglas Merriam and Lesley S. King, Farm Fresh Publishing. $45. In “Farm Fresh Journey: Santa Fe Farmers Market Cookbook,” Douglas Merriam (with Lesley S. King) uses photos, recipes and stories to spotlight the beauty and challenges of small-scale farming. 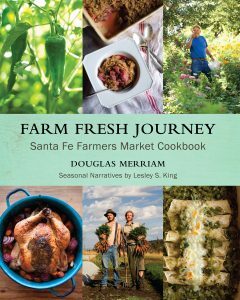 “Farm Fresh Journey: Santa Fe Farmers Market Cookbook” by Douglas Merriam and Lesley S. King, Farm Fresh Publishing. Merriam’s photos – of grazing animals, farmers working the land and crops growing in fields – convey his admiration for the intensive labor required by this type of farming. Merriam, who splits his time between Portland and Sante Fe, enlisted King, also a champion of farmers markets, to write the seasonal narratives and farmer biographies. Both King and Merriam sought to go beyond the farm-to-table, which they felt by now veers toward cliché, instead opting to follow a seed as it transforms into a vegetable or fruit. This seed-to-meal journey starts with the farmer planting the seed, and then records what both farmer and seed endure throughout the growing season until harvest. The recipes come from several sources: the farmers themselves; farmers market shoppers; and Merriam’s own kitchen, where he experimented with produce he brought home from the farmers market. As is apt for a cookbook dedicated to farmers and a farmers market, it’s divided into seasons, with stories and history prefacing each section. Merriam and King encourage readers to explore substitutions and adjust recipes to suit what’s at the market, and to see cooking itself as a journey. For example, Merriam states that many of the recipes call for goat’s milk because that is the most readily available dairy at the Sante Fe Farmers Market, but says to use cow’s milk if that is what you have on hand. A chef once told him that recipes are like maps: They show you how to get somewhere, but eventually you may find another way to reach your destination. Interestingly, the recipes in “Farm Fresh Journey” do not call for machinery such as food processors. Like the small-scale farming the book is centered on – which produces the ingredients that are called for in the recipes by physical work and animal traction – these recipes want us chopping and dicing, and getting our hands filled with the scents and stains of fresh food. Also, we’d have expected more of a produce disconnect for the Maine reader – a cookbook filled with recipes calling for Hatch chilies, figs and pistachios, say. In fact, there is plenty here for the Maine cook – from eggs and apples to strawberries, rosemary and root vegetables. Equally, the small-farms focus – pastured animals, no big equipment, the struggles with hail and drought — will be familiar to any fan of Maine’s many small farms. 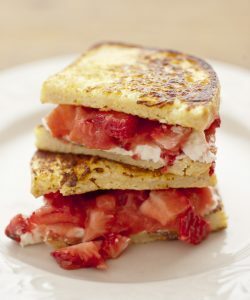 French Toast with Strawberry-Rhubarb Compote and Goat Cheese makes a scrumptious breakfast or dessert. Each recipe is accompanied by a full-page color photo of the completed meal. It was the photo – and also the recipe name – that made my family gravitate toward French Toast with Strawberry-Rhubarb Compote and Goat Cheese. This simple recipe brings together familiar ingredients and ideas – the combination of strawberries and rhubarb, fresh goat cheese, and standard French toast – to make a scrumptious breakfast or dessert. We still had chopped rhubarb in the freezer from last year’s harvest, and in keeping with the book’s use-what’s-at-hand philosophy, we substituted our homemade maple syrup for the honey the recipe calls for when we stewed the rhubarb. The tangy goat cheese, sweet strawberries, tart rhubarb and pure maple syrup mingled together and made this version of French toast far from ordinary. With only 1 tablespoon of maple syrup, the strawberry-rhubarb compote was unlike many other similar but far more sugary baked desserts we make; that factor, combined with goat cheese, made for a healthy treat. “Farm Fresh Journey” is full of straightforward, uncomplicated recipes that look and sound both healthful and appetizing. A tribute to farmers and to farmers markets, it more than lives up to its title, bringing readers along on a journey in the field and in the kitchen. To buy the cookbook, which is self-published, go to farmfreshjourney.com; a royalty from every book sold goes to the Sante Fe Farmers Market, which is celebrating its 50th birthday this year. I substituted maple syrup for the honey called for here, and cow’s milk for goat’s milk. The recipe instructs you to make 2 sandwiches, with the goat cheese and compote as the filling. We served the slices open-face, topped with the goat cheese and compote. Make the compote first by combining the rhubarb, honey and 1/4 cup water in a large saucepan over medium heat. Bring to a simmer, stirring until the rhubarb softens, about 10 minutes. Remove the pan from the heat and stir in the strawberries. Transfer the mixture to a bowl and set aside. In a baking dish or medium-sized mixing bowl, whisk the eggs and goat’s milk together. Dip the bread into the mixture and allow to soak for 10 seconds on each side. Melt about 1 tablespoon of butter in a large skillet over medium heat, and cook the soaked bread until golden brown, about 2 to 3 minutes per side. Remove from the skillet and repeat the process until all the bread is cooked. Spread the goat cheese on 2 slices of the French toast and spread the compote on top of the goat cheese. Place the remaining 2 slices of French toast on top of the goat cheese compote slices to make a sandwich.